Ozhotels is a directory of non-related and independently owned hotels, apartments and resorts providing accommodation in Port Douglas, Queensland, Australia. Oz hotels allows you to deal directly with these Port Douglas holiday apartments and hotels, thus giving you the best possible discount rates for this Port Douglas accommodation. Why look elsewhere for your next family beach holiday when you can compare and book your Port Douglas accommodation directly online with the hotels and save save save!!! The popular holiday destination of Port Douglas gives travellers from all over the world a huge choice of places to stay, ranging from fully self contained holiday apartments and luxury resorts through to affordable hotels and budget motels. This wide variety makes finding the ideal place that suits all of your holiday needs a difficult and time consuming task, which is why many people like to use the free services of an accommodation expert like OzHotels. Doing this allows them to compare hundreds of different properties that are situated all over Port Douglas, in order to find the one that meets their specific requirements and travel budget. The main advantages of booking online with OzHotels is that you can book your travel up to 12 months in advance and that you will be able to get an extra discount off the already cheap rates the longer that you holiday in Port Douglas. Providing the ultimate in luxury the Niramaya Villas and Spa has a range of 1, 2, 3 & 4 bedroom fully self contained villa apartments in Port Douglas. This luxuriously appointed Port Douglas accommodation is ideally set amongst 15 hectares of gardens and just a short stroll to the palm fringed sands of Four Mile Beach and the cosmopolitan village of Port Douglas. 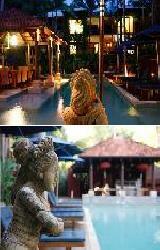 The Niramaya Villas and Spa provides all types of travellers with unforgettable accommodation in Port Douglas. It also features a wide range of modern amenities and services such as lounge bar, direct internet access, faxing facilities, free car parking, gymnasium, massage, restaurant, spa, outdoor swimming pool, tennis court, tour desk, bbq, massage room, garden, security entry, 24 hour reception and baby cots available. 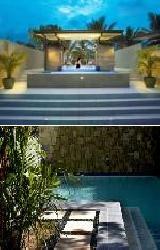 The Niramaya Villas and Spa in Port Douglas truly is the ultimate in luxury resorts. The Dreamcatcher Apartments in Port Douglas is the ideal choice for your truly memorable tropical North Queensland holiday. The fully self contained Port Douglas apartments at the Dreamcatcher Apartments ranges from standard to luxury studio, 1 and 2 bedroom apartments with a variety of bedding configurations. These multi-award design winning Port Douglas apartments are stylish, spacious and comfortable, with all of the conveniences needed to ensure your next Queensland holiday is a relaxing one. Fringed by the Great Barrier Reef and World Heritage Daintree rainforests, Port Douglas is a place where you can delight in the natural wonders, adventure and spectacular scenery for which this North Queensland holiday destination is renowned. The Dreamcatcher Holiday Apartments is the perfect base for your Port Douglas accommodation escape, set in a secluded beachside location just metres from pristine Four Mile Beach and minutes from the town centre of Port Douglas. Port Douglas, which is situated in Queensland's tropical north approximately 1 hour north of Cairns, is one of the world's favourite holiday destinations. From the luxury air-conditioned comfort of the Oaks Lagoons apartments guests can make the most of a range of special facilities including a private balcony, king size beds, European kitchen appliances, laundry and data phone facilities. At the Oaks Lagoons Apartments Port Douglas you can choose a fabulous courtyard garden apartment or indulge in a 'swimout' apartment with direct access to one of two breathtaking lagoon swimming pools. Other resort facilities at the 5 star Oaks Lagoons Apartments include expansive decks, cabanas with barbeques, lush ferns, tropical landscaping, soothing water features, an array of restaurants, bars and bistros as well as the spa and beauty facilities of adjacent Tree Tops resort. 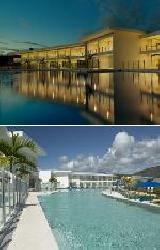 The Pool Port Douglas is a new luxury resort that is ideally positioned in the heart of Port Douglas. It provides the choice of 1, 2 & 3 bedroom apartments that are close to the centre of Port Douglas, 4 Mile Beach and the Port Douglas Harbour. The Pool Apartments in Port Douglas is the perfect holiday accommodation for the discerning leisure and business travelers with a central swimming lagoon that is 185 sqm and provides and exotic oasis nestled in the resorts landscaped tropical gardens. The resort apartments flow from this azure centrepiece, providing a luxury holiday experience like no other. This Port Douglas Apartments Resort is the ideal holiday accommodation for couples seeking a romantic getaway or business travellers in town for a conference, meeting or event. 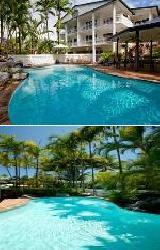 Pool Port Douglas Apartments is not an activity filled resort but is also a private and very quiet place to relax. The Marina Terraces is centrally located in the heart of Port Douglas, which is the perfect place for your next tropical holiday within Australia. This budget Far North Queensland accommodation is made up of 1 & 2 bedroom self contained serviced apartments that are ideal for a family holiday or romantic getaway. The Marina Terraces Apartment Resort is perfectly positioned with 250 meters to the beautiful Four Mile Beach and 100 meters to cosmopolitan Macrossan Street, with its many cafes, restaurants, shops and galleries. The Marina Terraces also features a wide range of modern amenities and services such as free car parking, outdoor swimming pool, tour desk, bbq, garden and airport shuttle. 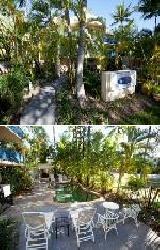 The Latitude 16 Port Douglas Coral Apartments offer excellent and affordable 1 bedroom self contained apartments, located across from Reynolds Park on a delightfully quiet leafy street teeming with birds of all sorts, across from Reynolds Park. Make your way to Four Mile Beach via a beach track that meanders through a tropical nature reserve delivering you right to the beach. The Latitude 16 Port Douglas Coral Apartments provides all types of travellers with discount accommodation in Port Douglas. It also features a wide range of modern amenities and services such as guest laundry, outdoor swimming pool, tour desk and bbq. Further guest facilities and services include free undercover parking, WiFi internet access, landscaped gardens, weekly serviced apartments, a free tour booking service to book trips to the Great Barrier Reef and Daintree National Park, airport transfers, luggage storage, vending machines and cot hire. The Latitude 16 Driftwood Manraray Apartments provides holiday makers with a range of affordable 2 & 3 bedroom self contained serviced apartments, ideally located at the quiet end of Macrossan Street, seconds from restaurants, shopping, nightlife and just 100 metres from the magnifcent Four Mile Beach. The Latitude 16 Driftwood Mantaray Apartments provides all types of travellers with discount accommodation in Port Douglas. It also features a wide range of modern amenities and services such as direct internet access, free car parking, spa, outdoor swimming pool and bbq facilities. Perfectly positioned on the main street of Port Douglas and just metres from the beach and a short stroll to the cafes, restaurants and shops the Driftwood Mantaray is the ideal beach holiday choice. The Saltwater Luxury Apartments Resort offers spacious architect designed apartments mixing sleek curves with strong lines and Asian influences. These luxury 2 & 3 bedroom apartments & penthouses are nestled in the heart of Port Douglas, just a few minutes walk from Port Douglas breathtaking Four Mile Beachi, Marina Mirage and the renowned restaurants and chic boutiques of Port Douglas Village. Close by to the Saltwater Luxury Apartments in Port Douglas are 2 world class golf courses as well as the magnificent Great Barrier Reef and Daintree Cape Tribulation Rainforest. 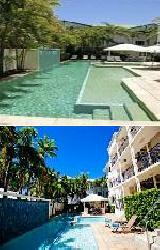 The Saltwater Luxury Apartments offers some of the newest and most elegant accommodation in Port Douglas. All of the luxury 5 star apartments are spacious, non smoking and include 2 bathrooms, high ceilings throughout, expansive living spaces, huge spa baths, fully equipped kitchens and ducted air-conditioning. The Garrick House Apartments offer luxury self contained studios, 1 & 2 bedroom self contained serviced apartments, ideally located just a short stroll to beautiful Four Mile beach and Macrossan Street, cafes, restaurants, galleries and night life. Situated on a quiet street lined with tropical palms, guests return to The Port Douglas Garrick House Apartments year after year for its charm and friendly ambience. The Garrick House Apartments in Port Douglas is close to everything that the city has to offer, as well as having a numerous guests facilities and services including direct internet access, disabled facilities, free car parking, outdoor swimming pool, tour desk, bbq, garden, airport shuttle, baby cots available and babysitting service. The Sunseeker Holiday Apartments offers travellers a range of 2 bedroom self contained serviced apartments that are ideally nestled amongst tropical gardens yet only metres from the magnificent Four Mile Beach. The Port Douglas Sunseeker Holiday Apartments are 3 minutes walk from the popular Macrossan Street dining and shopping district. The Sunseeker Holiday Apartments in Port Douglas are close to everything that the region has to offer, as well as having a numerous guests facilities and services including guest laundry, spa, outdoor swimming pool, tour desk and bbq facilities. The Port Douglas Sunseeker Holiday Apartments offers a premium location without high street prices, making it the perfect place to stay and have long walks on the beach and long lunches in the village. 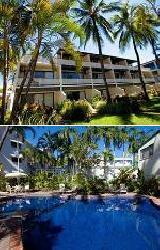 The Latitude 16 Tropic Sands Apartments Port Douglas offers 1 bedroom self contained serviced apartments accommodation in a boutique tropical style resort. Located amongst the palms and native trees, The Latitude 16 Tropic Sands Apartments Port Douglas is only a short walk from Four Mile beach, just 500 metres from Port Douglas Marina. The Latitude 16 Tropic Sands Apartments in Port Douglas is close to everything that this holiday destination has to offer, as well as having a numerous guests facilities and services including direct internet access, faxing facilities, free car parking, outdoor swimming pool, tour desk, bbq, garden, airport shuttle, cot hire and luggage storage. The Tropical Reef Apartments offers 2 & 3 bedroom self contained serviced apartments in the heart of Port Douglas.One of the larger properties in this sought after area of Port Douglas, The Tropical Reef Apartments is fortunate to have two entrances, only 250 metres to the magnificent Four Mile Beach and 2 minutes walk from the restaurants and cafes on Macrossan Street. 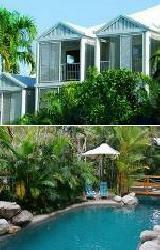 The Tropical Reef Apartments provides all types of travellers with discount accommodation in Port Douglas. It also features a wide range of modern amenities and services such as free car parking, guest laundry, spa, outdoor swimming pool, tour desk, bbq, garden, airport shuttle, dry cleaning service, weekly room servicing and luggage storage. 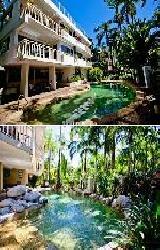 The Port Douglas Tropical Reef Apartments is the perfect family holiday location. The Port Douglas Beachfront Terraces Apartments offer 1 and 2 bedroom self contained serviced apartments with a fabulous beachfront location. Step out from your apartment and walk across The Esplanade to the magnificent Four Mile Beach. The Port Douglas Beachfront Terraces in Port Douglas is close to everything that the Far North Queensland region has to offer, as well as having a numerous guests facilities and services including direct internet access, faxing facilities, free car parking, restaurant, room service, outdoor swimming pool, tennis court, tour desk, bbq, garden, airport shuttle, baby cots available and babysitting service. The Port Douglas Beachfront Terrace Apartments are perfect for guests looking for affordable, clean accommodation in an excellent beachfront location, directly across from the safe swimming enclosure and Surf Life Saver's patrolled beach area. 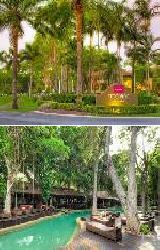 The Ramada Resort Port Douglas is one of the best tropical hotels in Port Douglas and is ideally set amongst rainforest gardens and featuring a tropical lagoon pool with waterfall and swim-up bar. Conveniently positioned just a short walk from beautiful Four Mile Beach, close to the Daintree Rainforest and Great Barrier Reef, the Ramada Resort Port Douglas offers spacious hotel accommodation rooms combined with modern resort facilities and services and is minutes from the village centre with its shops and galleries. The Ramada Resort Port Douglas has many guests facilities including lounge bar, conference centre, currency exchange services, direct internet access, free car parking, guest laundry, gym & fitness equipment, lift, massage, restaurant, room service, spa, outdoor swimming pool, tour desk, garden, airport shuttle, 24 hour reception, baby cots available, babysitting service, daily housekeeping and beauty salon/day spa. Allow the friendly staff to recommend and assist with your touring requirements, their experience and knowledge will ensure you choose the tours that suit your tastes and will make sure you make the most of your time in this very beautiful part of the world. 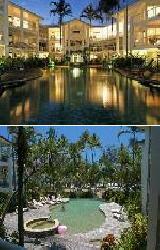 For a memorable tropical holiday then stay at the Paradise Links Resort in Port Douglas. 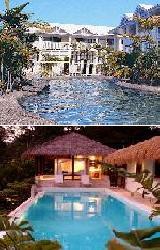 It provides the choice of hotel, 1, 2, 3 & 4 bedroom apartment accommodation just 500m from the beautiful 4 Mile Beach. 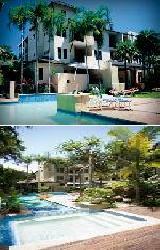 The property is ideally set amongst tropical gardens and provides spectacular golf course views. The Paradise Links Resort Port Douglas is the perfect escape for a family holiday, golfing trip or a romantic weekend getaway to Port Douglas. It also features a wide range of modern amenities and services such as business centre, direct internet access, faxing facilities, free car parking, outdoor swimming pool, tennis court, tour desk, bbq, airport shuttle and baby cots available. The large modern 2 and 3 bedroom apartment accommodation at the Nautilus Holiday Apartments in Port Douglas all have 2 bathrooms, full kitchen and laundry facilites, air conditioning, Free lock up car parking, wireless internet access, novel and magazine library and DVD & bicycle hire for guests. This wonderfully affordable Port Douglas accommodation is ideal for the entire family and is situated only a short 2 minute walk to Port Douglas' famous 4 mile beach and a leisurely 10 minute walk to the centre of Port Douglas. When you stay at the Nautilus Holiday Apartments the Great Barrier Reef is just waiting to be explored as well as the tropical rainforest and numerous deserted beaches which are only minutes away by car. The Beaches Port Douglas is the ideal holiday getaway for families and groups of friends, offering 2 & 3 bedroom self contained serviced apartments accommodation in the heart of Port Douglas. Overlooking Four Mile Beach the Beaches Port Douglas Serviced Apartments are perfectly located on The Esplanade, close to restaurants, cafes, boutique shopping and, of course, the famous Four Mile Beach. The Beaches Port Douglas in Port Douglas is close to everything that the region has to offer, as well as having a numerous guests facilities and services including free car parking, guest laundry, spa, outdoor swimming pool, tour desk and bbq. Business facilities include WIFI in all apartments and throughout the resort, faxing facilities and photocopying services. Mowbray by the Sea offers luxury 2 bedroom 2 bathroom self contained serviced apartments that give you sophisticated beachside accommodation only metres from the white sands of Four Mile Beach and just 1 minute walk from The Esplanade and famous Macrossan Street's boutique shopping, cafes and award winning restaurants. 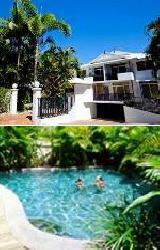 The Mowbray by the Sea provides all types of travellers with discount accommodation in Port Douglas. It also features a wide range of modern amenities and services such as direct internet access, faxing facilities, free car parking, spa, outdoor swimming pool, tour desk, bbq, garden, airport shuttle, babysitting service, car hire facilities, dry cleaning service, cot hire and luggage storage. The Reef Club Resort in Port Douglas is located just minutes walk from 4 Mile Beach and the famous Macrossan St where you can enjoy breakfast at one of the many cafes and restaurants or nightlife entertainment at the vibrant bars. The Reef Club Resort Port Douglas provides the perfect base from which to explore the nearby Great Barrier Reef and Daintree Rainforest. 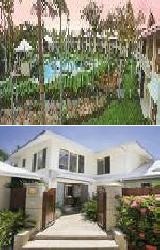 The Reef Club Resort Port Douglas offers quality 1 & 2 bedroom self contained apartments in an excellent location. The self-contained apartments have a rustic Mediterranean feel with terracotta floors, timber louvers and earthy tones reflecting the tropical style of North Queensland. This makes the Reef Club Resort the perfect tropical holiday getaway for couples and families. Surrounded by tropical foliage and shady palms the swimming pool and outdoor spa is the perfect place to bask in the tropical sun or have a barbeque with fresh local seafood. 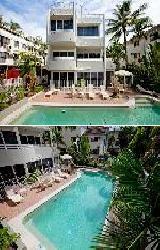 Reef Club Resort Port Douglas provides very affordable resort apartment accommodation in the heart of fabulous Port Douglas. The Hibiscus Resort and Spa Apartments are perfectly located in Port Douglas and provide tropical Far North Queensland accommodation that you will never forget. It is a stunning spa holiday resort that is set in a superb location boasting award winning services and resort facilities. This studio, 1 & 2 bedroom self contained apartment accommodation is ideally located just 100 metres from the main shopping area in Port Douglas Village, 300 metres from famous Port Douglas Four Mile Beach and is also close to the World Heritage Great Barrier Reef and the Daintree Rainforest. At the Hibiscus Resort and Spa Apartments in Port Douglas the lush, tropical gardens swirl around your own private balcony and carved stone statues guard the inviting swimming pools & ponds. All apartments are furnished with lovely teak furnishings to complement the tropical ambience and floor to ceiling western red cedar plantation bi-fold shutter doors. The recreational facilities at the Hibiscus Gardens Spa Resort include two outdoor swimming pools, BBQ facilities, entertaining area, free car parking, landscaped gardens, babysitting services, internet, poolside restaurant, room service, day spa, massage service and beauty salon. A Tropical Nite Holiday Townhouses offers modern, spacious 1, 2 and 3 bedroom townhouse apartments that can sleep up to 7 guests, with each apartment overlooking the landscaped pool. These luxury holiday townhouse apartments are within walking distance of all the Port Douglas attractions including the Four Mile Beach, Marina Mirage and Macrossan Street with its fantastic array of bars, galleries, cafes and restaurants. Port Douglas is one of the worlds most sought after international destinations and with The Great Barrier Reef, Daintree National Park, Cape Tribulation, Kuranda and the Atherton Tablelands all within an hours travel it is no wonder that it is so popular. landscaped tropical gardens. The resorts facilities include a free form salt-water pool, large covered BBQ outdoor entertainment area, landscaped tropical gardens, free on-site undercover car parking, tour desk, babysitting service, on-site bike hire and DVD hire. A Tropical Nite Holiday Townhouses are a real home away from home - perfect for holidays or longer stays, for couples, groups and families. The Coconut Grove Apartments in Port Douglas is a tropical North Queensland retreat that epitomizes what luxurious Port Douglas accommodation is all about. Situated in cosmopolitan Macrossan Street, just 140 metres from the magnificent 4 Mile Beach and with views of rainforest mountains and blue seas the Coconut Grove Apartments is a place to be enjoyed by all. The 1, 2 & 3 bedroom self contained holiday apartments and penthouses come complete with their own outdoor entertaining terrace and are set right in the heart of Port Douglas close to the fantastic restaurants, bars and boutique shopping. 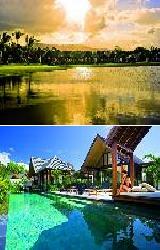 The resorts calming water features and lush tropical setting will satisfy the most discerning holiday maker. Other facilities at this Port Douglas accommodation include a tour desk, landscaped gardens, beautiful swimming pool with 20 metre lap pool, spacious entertaining area with cooking facilities and secure car parking. The discount accommodation at the Port Douglas Sands Resort consists of fully self contained 1, 2, and 3 bedroom apartments in one of the most popular resort areas in Australia. Located only minutes from shops, fine restaurants, the Port Douglas marina, the world famous 4 mile beach and opposite the Sheraton Mirage Resort the Port Douglas Sands Resort is the perfect holiday destination for couples on a romantic getaway as well as families looking for that something special on their next Queensland holiday. Each of these affordable Port Douglas apartments has been designed and decorated to capture the feel of the tropics and have been built around a magnificent lagoon-style swimming pool, spa and barbecue area. There is also a superb 18 hole golf course and luxurious country club within an easy stroll from the Port Douglas Sands Resort. The Lychee Tree Holiday Apartments offer an affordable alternative for those people looking for quality Port Douglas accommodation within walking distance to the beach and all that this tropical North Queensland destination has to offer. The Lychee Tree Apartments has a range of 1 and 2 bedroom fully self contained apartments which are guaranteed not break the budget. Ideal for families, couples and groups of friends the Lychee Tree Apartments Port Douglas are air conditioned, have full cooking and washing facilities, a TV with DVD player and are extremely spacious. The Lychee Tree Apartments in Port Douglas has a gorgeous salt water resort pool, with a shallow end for the kids, comfortable sun lounges surrounding the pool along with swaying palm trees to complete your relaxation in the tropics. Situated an easy 4 minute walk to the splendour of Four Mile Beach and a 10 minute walk from the Port Douglas town centre the Lychee Tree Holiday Apartments is the ideal discount Port Douglas accommodation for the entire family. 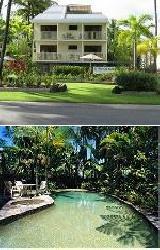 Set amoungst 15 acres of lush tropical gardens the Rendezvous Reef Resort is located just minutes from the township of Port Douglas and the stunning Four Mile Beach. The Rendezvous Reef Resort provides holiday makers with a wide choice of Port Douglas accommodation styles ranging from stylish 1 and 2 bedroom villa apartments right through to the spacious deluxe 3 bedroom family villa. At the Rendezvous Reef Resort there are also superb recreational facilities which help to make this accommodation perfect for those guests seeking a relaxing getaway or a family holiday filled with fun and excitement. Positioned only an hours drive north of Cairns along one of the most picturesque coastal roads that you are ever likely to see Port Douglas is the perfect place from which to explore the 2 World Heritage listed areas that exist side by side, the Great Barrier Reef and the rainforest of the Daintree and Cape Tribulation. The Port Douglas Plantation Resort offers the very best holiday apartments in Queensland's world famous tropical retreat, Port Douglas. On the doorstep of this Port Douglas accommodation are so many World Heritage wonders, including the Great Barrier Reef and the Daintree Rainforest. The resort style apartments at the Port Douglas Plantation Resort is seecond to none and includes king size beds, air-conditioning, individual ensuites, Free cable TV, in-house movies, fully equipped kitchens and private balconies. Also included at this Port Douglas holiday resort is the use of the large swimming pool with spa bath, waterfall, lap lane and wading area, tennis court and BBQ area. This peaceful and tranquil Queensland holiday resort is also close by to the magnificent 4 mile beach, 2 world championship golf courses, the fabulous Marina Mirage, numerous 5 star restaurants, sidewalk cafes and trendy shops and boutiques in the Port Douglas township. Surrounded by diverse and spectacular natural beauty the Sheraton Mirage Resort Port Douglas offers luxury accommodation in Queensland's Tropical North. A wholly self contained resort, the Sheraton Mirage Hotel is the perfect base from which to explore the wonders of the Great Barrier Reef, Daintree Rainforest and Mossman Gorge. With 5 hectares of swimmable saltwater lagoons, freshwater swimming pool, spa and children's pool, 18-hole championship golf course, floodlit tennis courts, saunas, gymnasiums and a pro shop the Sheraton Mirage Resort is a truly unique Port Douglas accommodation experience.